Well! If the title has caught you off guard, then don't worry. Move to iOS is an Android app from Apple. It helps Android users to switch from an Android device to an iPhone. Whether you have bought a new iPhone and want to switch all the data from your old Android or the Android device is no longer of any interest to you. In both cases you need to move your data from the old phone to iPhone using the Move to iOS app. In this article, we are going to help you how to make the transition from an Android phone to iPhone, with the help of Apple'sMove to iOS app. What does Move to iOS Transfer? As we have already explained about the Move to iOSAndroid app in the previous section of the article. Let's learn some more about it. Using Move to iOSAndroid app you can transfer a wide range of data including call logs, message history, web bookmarks, contacts, camera photos and videos, mail accounts, free apps, calendars etc. Though, it is a reliable app as it is from Apple, at times the app behaves strangely in case there is a drop in Wi-Fi signal during data transfer. Download Apple'sMove to iOS app from the official Apple website on your Android mobile. Install and launch this app afterwards. Ensure that your Android phone is connected to a strong Wi-Fi network. Get your new iPhone and then do its setup. It will prompt for connecting to Wi-Fi, do that and move to 'Apps & Data' option over there. Now, under this section tap on 'Move Data from Android' and click the 'Continue' button. When the screen will display a password, note it down. Again come to your Android phone and hit the 'Continue' button followed by the 'Agree' button. When the prompt insists for a password, enter the password you have obtained on your iPhone just now. Now that your devices are ready to transfer data using Move to iOS app, go to the 'Data Transfer' tab on your Android phone. Select the checkboxes against the desired data such as 'Messages', 'Camera Roll', 'Google Account' etc. and tap 'Next'. Allow some time to get the data transferred completely and the press 'Done'. As soon as the data gets synched on your iPhone, move to setup again and complete iCloud account set up. You can view all the transferred data here. 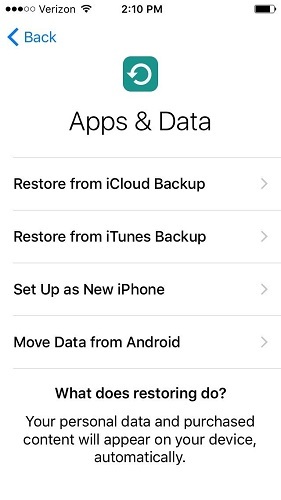 You can only transfer data to a new or factory reset iOS data from your Android device through Move to iOS app. This app is compatible only with a common Wi-Fi network for establishing the connection and make the transfer happen between the Android and iOS device. It doesn't get the apps from Android to iOS nor does it find them on the App Store for you. You don't have a clue about how many items got transferred with this app as it doesn't show proper notifications. Sometimes the app behaves weirdly and hampers data transfer mid way. 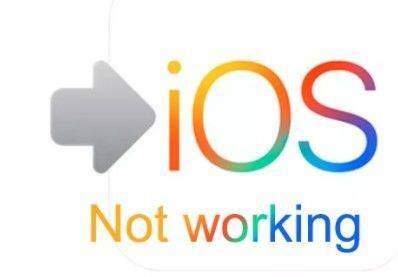 After understanding the shortcomings of Move to iOS we think there should be an alternate foolproof method. For overcoming the Move to iOS not working issue, there is an amazing software called Tenorshare iTransGo. This software not only transfers entire Android device content to a target device or a computer, but also clones your phone. You can use the software to copy files to an iOS device as well as selectively migrate data. While speaking of data security during Android to iOS transfer, it proves to be a secure and reliable method. Step 1: Get Tenorshare iTransGo software downloaded and installed on your PC. Launch the application and then connect your Android and iOS device through USB cables to the PC. Step 2: Once the devices got connected, click on the 'Next' button. Mark Android as the source and iPhone as the target device in Tenorshare iTransGo interface. The software will take a while to analyze the device data and move to the next step. Step 3: Now, select the desired data type you want to transfer or mark 'Select All' to transfer all the data from Android to your iPhone. Hit the 'Start Transfer' button afterwards, so that the data transfer is initiated. If it's not a new iPhone, all the data will be erased from it and then the software will copy the data from Android phone to the iPhone. After understanding Move to iOS not working issues, we believe Tenorshare iTransGo is the only method to securely transfer data. It can even save a copy to your computer, so there is no threat of losing the transferred data accidentally. With this tool selective data migration is a cakewalk.